It's time for Lord Stanley's bowl to be awarded. All 30 teams fought hard (except the Sabres), but we are down to the final two. All the sports sites like to point to stats, depth, grittiness and a hundred other ideas to come to their prediction of who will raise the Holy Grail. Being a card blog, let's just look at what Upper Deck thought about the two teams during this year's flagship hockey release. Score the cards and we determine the winner. Simple, right? 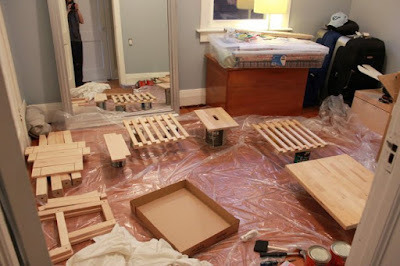 Where the hell is panel BF? 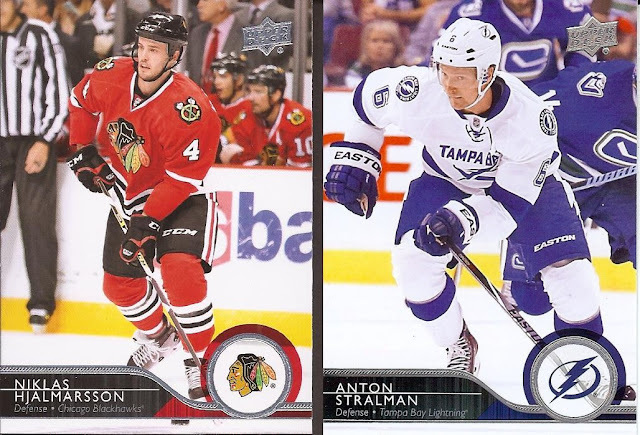 For this comparison, I took the team sets from both series of the 2014-15 Upper Deck release. Fortunately, I have all but one of the cards (how about some want list help folks?). 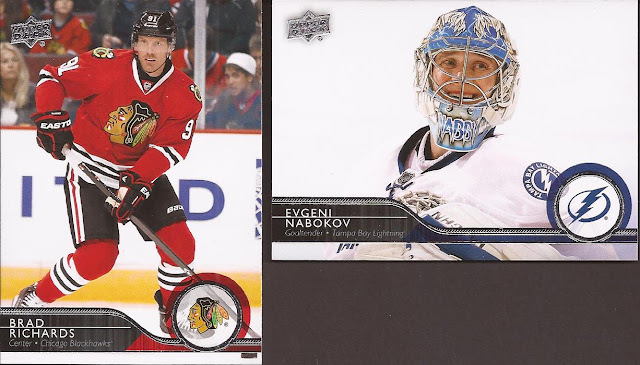 In the two series, the Blackhawks have one more card in series 1, so I omitted that from the scoring. 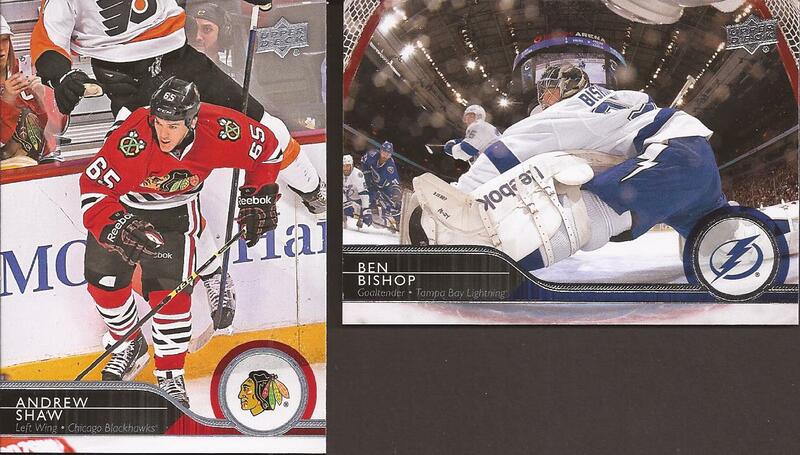 The player on the card was traded away anyway (Ben Smith). I took the cards in order, placed them side by side and scanned. While comments will be made, the ultimate decision is based on which card looks better. Got it? Let's go. First up we have Shooter for the Hawks, and team captain Stamkos. Both in away uniforms. Sharp is the expected action shot one would see on hockey cardboard. Steven looks.....troubled. Not sure about the grimace on his face. I guess he is looking for the puck. Going with Sharp. Two goal scoring celebrations, from Filppula and Captain Serious. 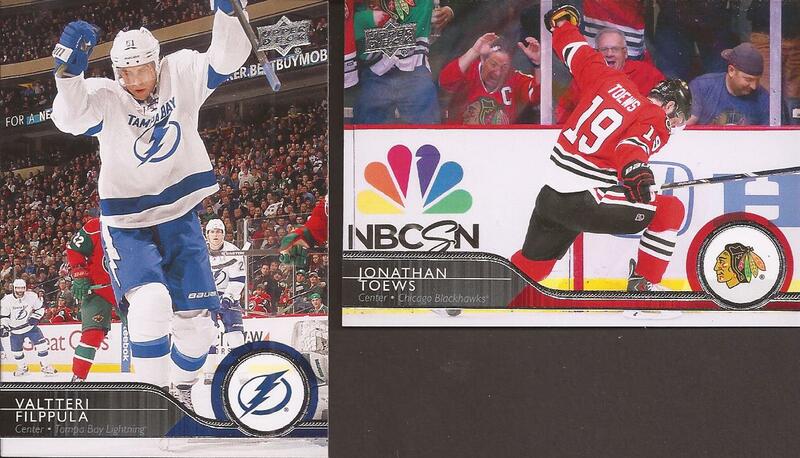 Plug for NBCSN and Honda with Toews while Filppula gets Great Clips, Reebok and Best Buy. Toews easy win with the horizontal card. BTW, I noticed I didn't keep the teams on the same side. It's because of the horizontal cards. This isn't hare to follow. Tyler Johnson vs. Marian Hossa. Hoss just scored another goal and the crowd is dancing the Chelsea Dagger. Johnson is about to let one fly on the Sabres. Perfect timing catching the shaft of the composite stick mid bend. Johnson with the win here. Killorn against Seabrook. The shots are so close they might as well be photoshopped. 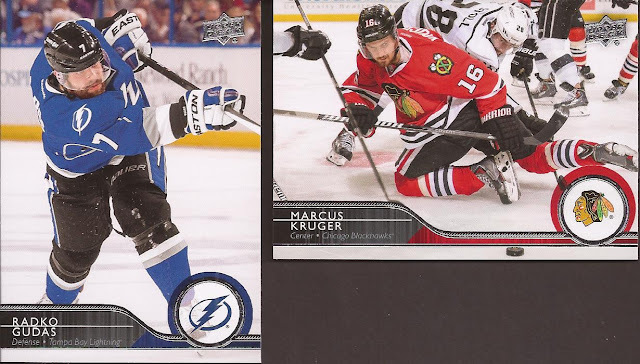 However, Killorn is in that DREADFUL alternate the Lightning have. Seriously guys, get rid of that thing. It's embarrassing. 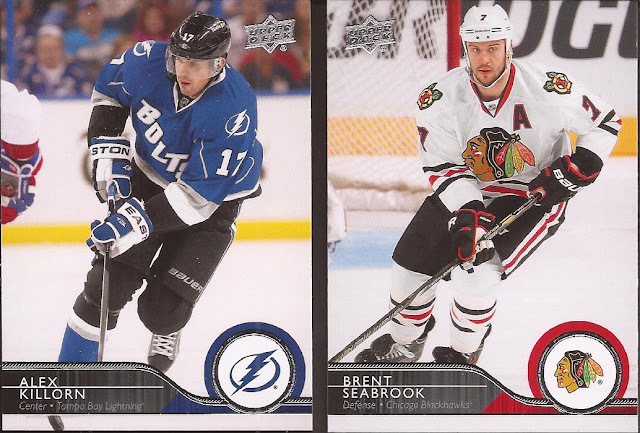 Seabrook wins. 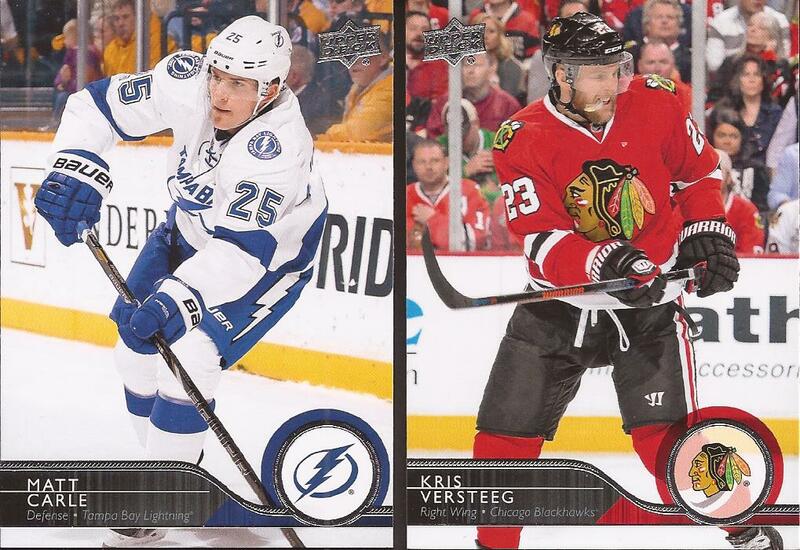 Matt Carle and Kris Versteeg. I really want to like Kris. He has a lot of talent and when he is focused he can be dangerous on the ice. He gets lazy though, and that's why he has been a healthy scratch for many games. Carle appears to be making an outlet pass. I am giving this to Carle for one big reason: Versteeg's stick is up. Dammit - get that thing on the ice! You can't score from there. Gudas for Tampa and Kruger for Chicago. Again, the crappy alternate. But the greatness of that Kruger card, with the puck below the border, would beat the regular sweater. 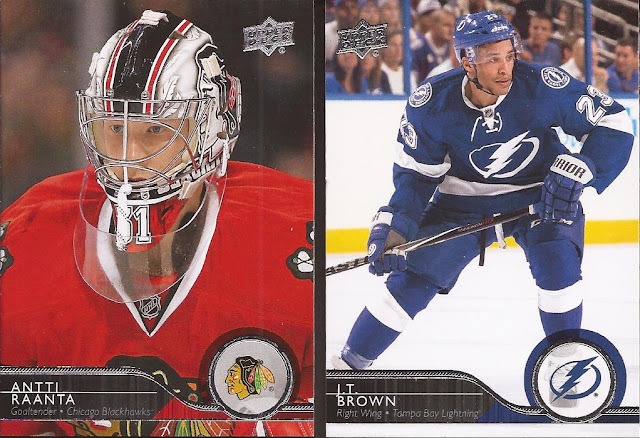 Netminder Corey Crawford and winger Ondrei Palat. This round is tough. 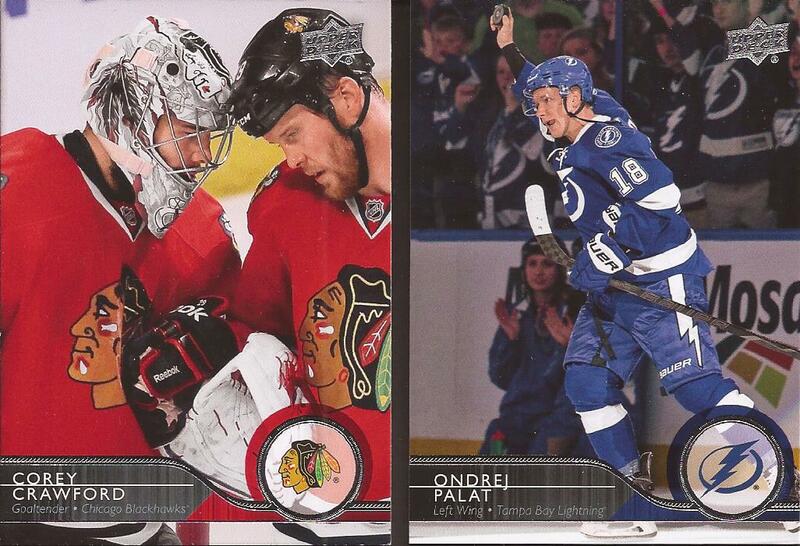 End of game celebration for Crow, and I'm assuming a milestone goal for Palat. I want to lean towards Crawford, with the nice shot of the mask. But I am giving this to Palat. Good framing and the "natural" lighting highlight him well. Great shot of Shaw ducking out of the way from being run over by a Flyer. Any other round, that would win. But man, amazing in the net shot of Ben Bishop. UD set itself apart in the card world with images like this. Panini could have learned something. Raanta and Brown. Brown is, again, the standard action photo. Raanta is showing off his mask and staring down someone. Antti gets the nod. Brenden Morrow. Patrick Kane. Really? Brad Richards about to feed a pass over to either Kane or Versteeg (unless Q did line shuffling already). I wonder what Nabokov is laughing about? The all white background frames his card well. Bicks just scored, which this post season has happened far too little. 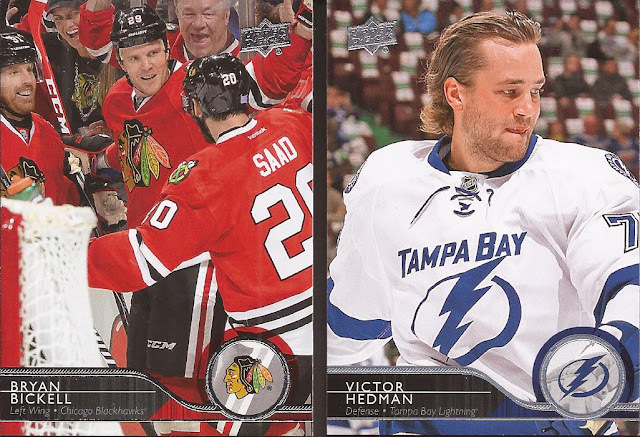 Hedman is rocking the long flowing hair. I don't think it's a mullet. Liking the fans behind Bickell for this one. That old dude is very happy indeed. Battle of the horizontal cards. Two time (soon to be 3 time) Norris trophy champ Keith goes against Ryan Callahan trying to slide one past Dustin Tokarski. You can't see the puck on Callahan's card, but I think it made it in 5 hole. Goal and win to Ryan. Last cards have a battle of blue liners, Ham Sandwich against Stralman. Niklas is looking to pass and I think Anton is racing up the ice to get the icing call. Or maybe jumping in on an odd man rush. 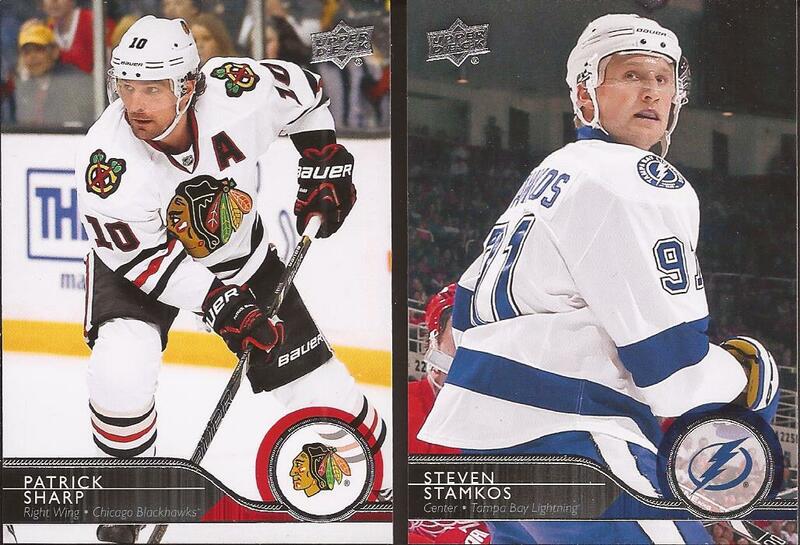 Even cards, but the extra point goes to Stralman for the nice Canucks sweaters. Those need to be their standards and jump that jumping orca disaster. Well how about that. We are tied. For overtime, let's decide this with a simple audio test. Fog horn/goal score songs. Click "Listen Here" beneath each logo. You will be taken to a page with the current sounds. Hawks in 5. Bishop will be hearing that in his sleep. I'm now going to have to scoop this years set, that Bishop shot is AMAZING and an example of what he'll be doing all series. 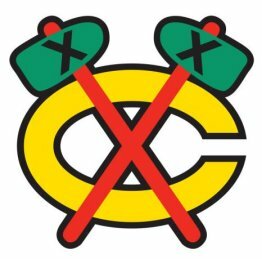 Good luck to the Blackhawks -- all my Illinois cousins are huge Hawks fans, and hockey really shouldn't be played in Florida. 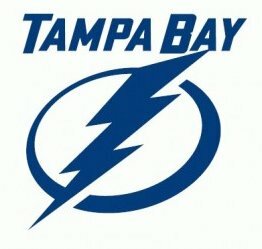 I bet the NHL brass let out a collective groan when the Lightning beat the Rangers. A Hawks/Rangers series would have probably been decent ratings.....for hockey. 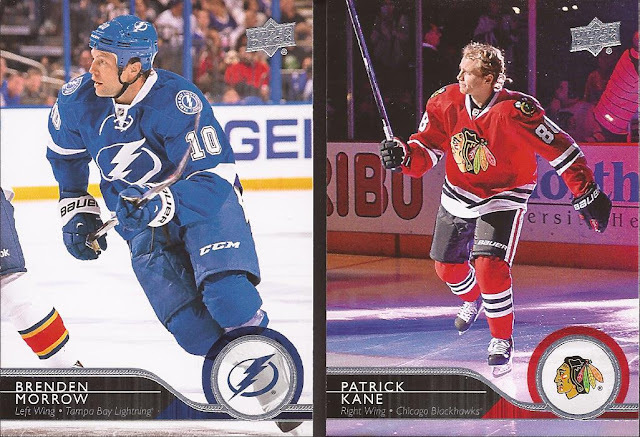 You will be happy to know the bolts ditched that 3rd jersey for one that is.....different. 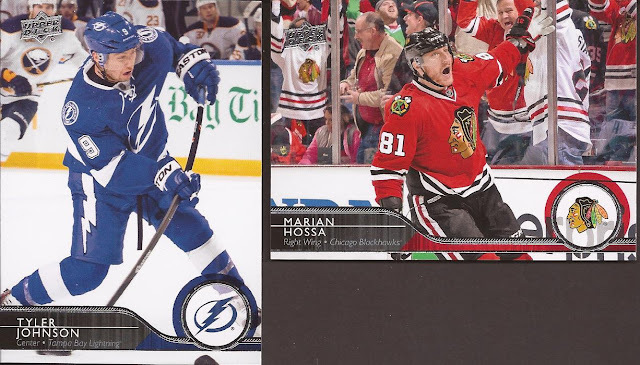 Same "BOLTS" across the front on an all-black jersey.